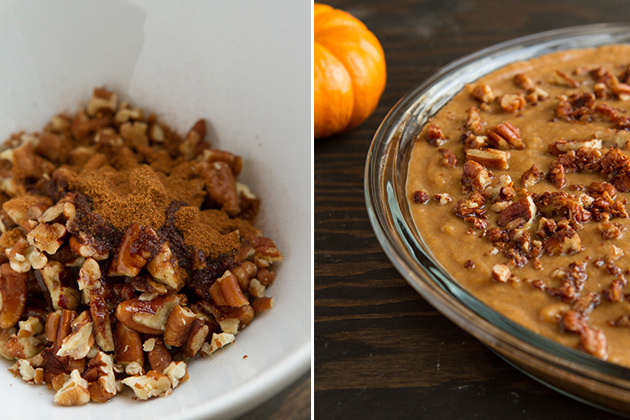 The easiest most healthy pumpkin pie you’ve ever indulged in. 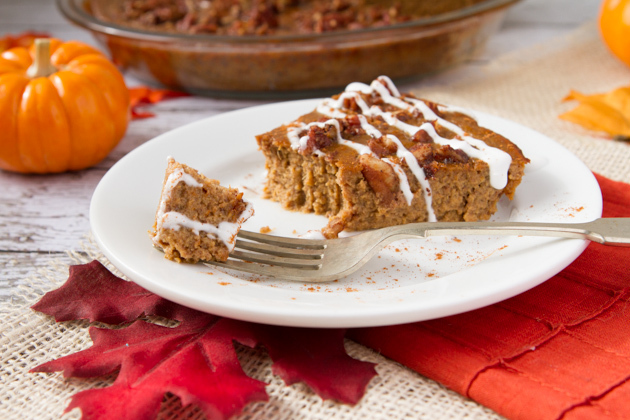 It’s wheat-free, gluten-free, grain-free, dairy-free, paleo, and high in protein! I’ve been feasting on all sorts of yumminess during my visit to Victoria, BC. I’ve been pleasantly surprised to see gluten-free, grain-free, and paleo options in the most unlikely of places. Before, when I was afraid of my allergies and food sensitivities, I stressed out about traveling. I was worried that restaurants would find my questions annoying or that there would just be no options. But? No matter where I go, or what I do, I never, ever go hungry. If you’re here in Victoria, planning a trip to the city or have always want to go… you HAVE to check out Cafe Bliss, Be Love, Re-Bar and Wild Coffee. I’ve had a bunch of opportunities to feast on desserts during my stay, but I haven’t been in the mood. It might have something to do with all of the last-minute dessert baking I was doing in preparation for my Christmas dessert cookbook launch (coming this Tuesday!) or, that I made (and ate) this pie the day before I left for my trip. Note the emphasis on made AND ate. Yeh. Kevin and I polished off this bad boy in a day. Pie for breakfast? Totally acceptable when there’s no crust. It’s practically a smoothie… just thicker… and sweeter. 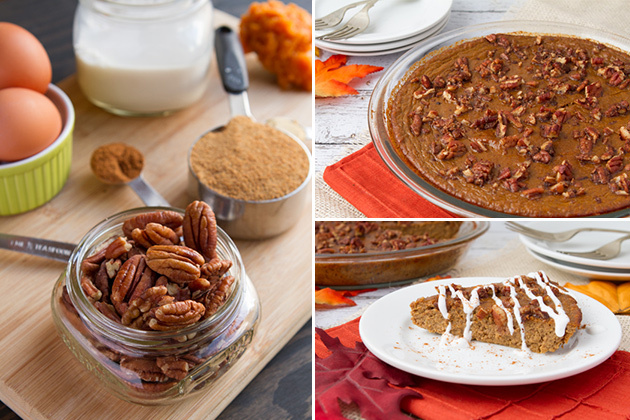 The easiest most healthy pumpkin pie you've ever indulged in. 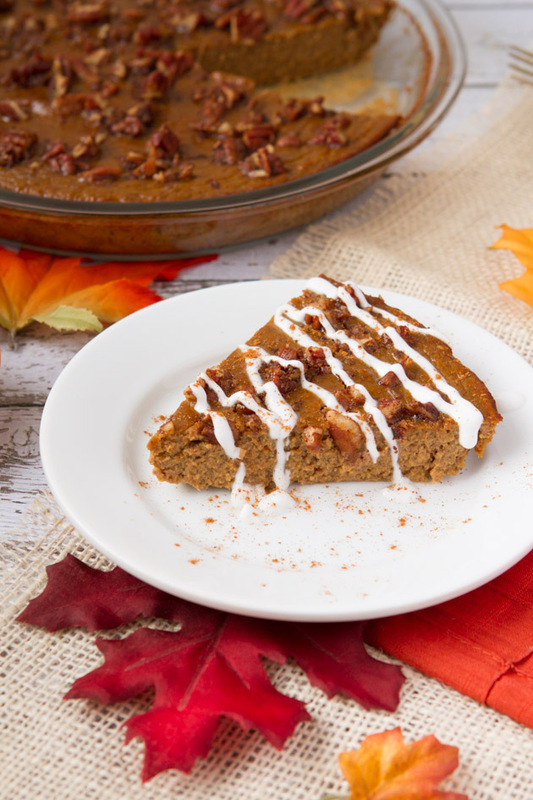 It's wheat-free, gluten-free, grain-free, dairy-free, paleo, and high in protein! 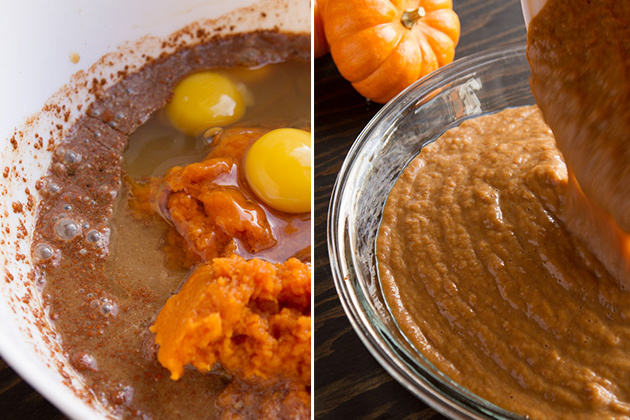 15 ounces canned pumpkin puree - not pumpkin pie filling! Preheat oven to 325F and lightly oil a 9-inch pie plate with a dab of coconut oil. Combine pie ingredients in a large bowl and whisk to combine. 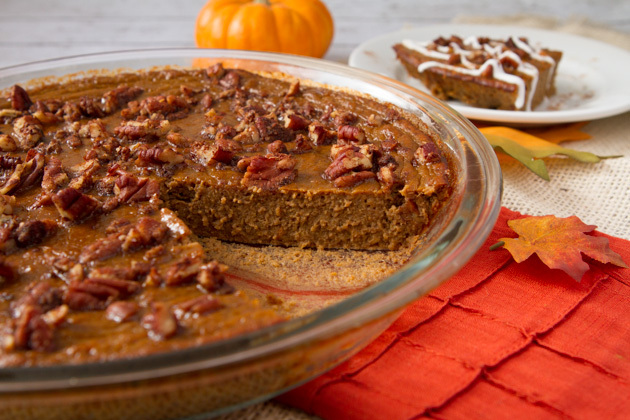 Pour into the prepared pie plate and set aside. Add topping ingredients to a small bowl and stir until the nuts are coated. Sprinkle the mixture over top of the pie. Bake in preheated oven for 55-60 minutes or until toothpick inserted comes out clean. Remove from the oven, allow to cool for 1 hour. Cover and place in the fridge overnight to chill. Serve with a drizzle of full-fat coconut milk. Protein Powder - I used unflavored, nonGMO, gluten-free soy protein powder as I have been diagnosed with low estrogen and soy helps me increase my levels. You can use whatever protein powder you'd like to here. I would recommend unflavored so that it doesn't affect the taste. 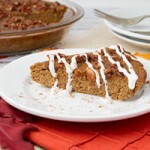 Alternatively, you could use something like coconut flour, almond flour or perhaps ground flax seed as a replacement. Eggs - sorry, I didn't test this recipe without eggs. You could try replacing the eggs with chia seeds (2 teaspoons ground chia with 2 tablespoons of water for every egg in the recipe) but I'm not sure it would work. If you give it a try, let me know how it goes! I didn’t have a bowl, so I used a pot for the first attempt at this recipe. And, through the magic of… photographs, now everything is in a bowl! 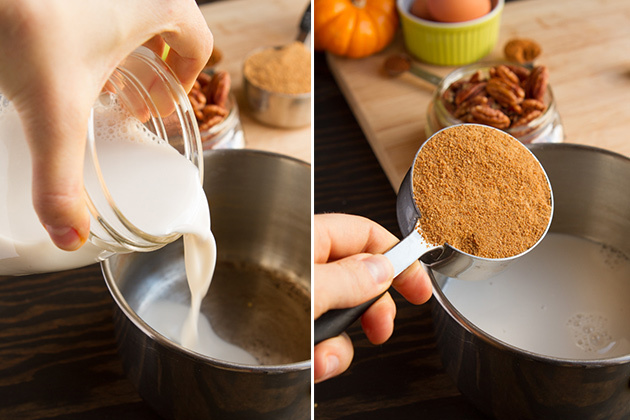 Pour mixture into a 9″ pie plate and set aside. Talk about a pumpkin-filled week! 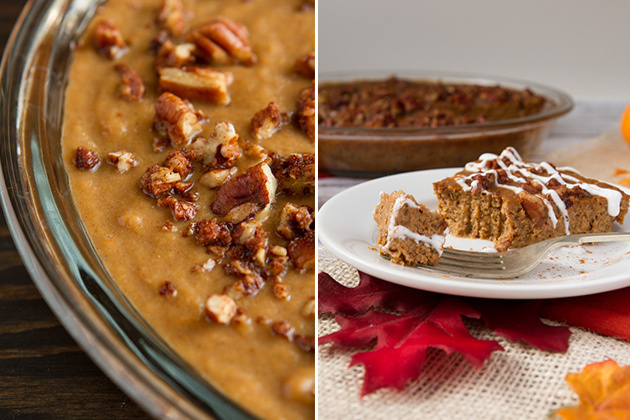 Chocolate Pumpkin Protein Bars, Pumpkin Spice Latte Smoothie (scroll to the bottom of the page), Vegan Speckled Pumpkin Curry… which was your favorite?